The development of the smart phones enable us to live a more colorful and convenient life, because the mobile phone can provide us large quantity of information and news, enable us to watch videos, read books, listen to music and communicate with others in various ways. Nowadays the smart phone can almost do everything that the computer do, thus managing your smart phone is important. The problem with Android smartphones is that if you are recording a video and the phone suddenly shuts down due to low battery or other reasons, the video will be destroyed. If you record a video for 10 minutes, all videos will be lost because the video is corrupted or damaged. Until now, there are not many solutions to solve this thorny problem. But don't worry too much, in this article, we will show you how to easily repair damaged, damaged and damaged videos on your Android smartphone. Even if it can't be fixed, we will show you how to completely remove these damaged media files and prevent them from taking up your Android phone memory. Part 1: How to Fix Corrupted Videos on Android Phone? Part 2: How to Delete Corrupted Media Files from Android Permanently? 1. You need to have the corrupted video and another reference video recorded again with your phone. 2. Select the two videos and the app with fix the corrupted one. This tool has been tested by many users, and the test result is that it is indeed effective. The app was able to repair damaged videos that other software applications weren't able to do so. If you want to repair damaged and corrupted videos on your Android smartphone, check out the app here. Android phone has accoutered for over half of the global market share so it is common to see the wide use of the Android. And here we will recommend you the software is also designed for Android phones. You know, there are plenty of applications and media files in the internet and sometimes the movies or TV series you downloaded may be corrupted by viruses or broken by mistake. What will do if you can not delete the corrupted media files in normal ways and you can not just leave the files alone because not only it will take up much space but also your mobile phone will be attacked by the viruses. Do not worry, Here we will offer you a guide to delete the corrupted media files forever with a third party tool - Android Data Eraser. This is professional software can help you to delete the files with no opportunities to be restored. The program can detect and scan the files in the Android phone automatically and thoroughly. What's more, the files it can delete including not only the corrupted files but also documents, contacts, messages, books and so. Almost all popular Android devices on the market have been supported, including Samsung Galaxy, HTC One, LG Optimums, Motorola Droid, Sony Xperia, etc. As a totally clean software, the program has no adware, spyware or viruses so you will not interrupted by any advertisements when you use it and your information is safe at the same time. If you still doubt about the software, you can download the Free Trial Version to have a try. And there are two versions available, so you can click the left icon below to download the Windows version or click the right icon to download the Mac version. How to Clear Corrupted Media Files from Android Phones? Step 1. Download and install the eraser software on your computer at first. After that, connect your Android phone to the computer with a USB cable and let the software recognize your mobile phone by following the on-screen interface. Step 2. Tap the "Erase" button on the main interface and click "Medium" on the next interface. 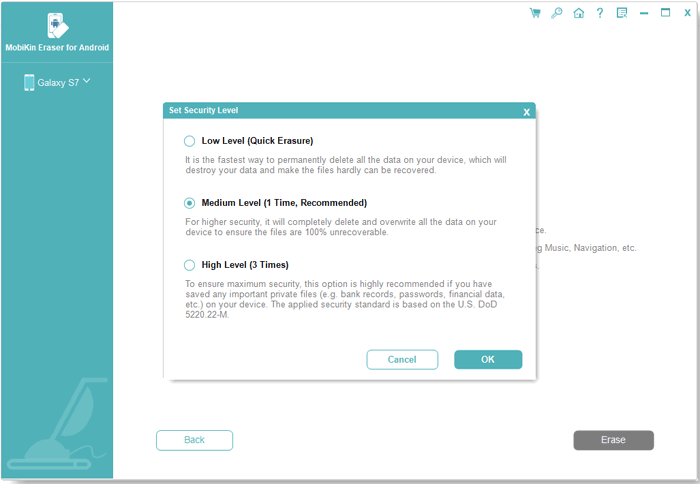 After that, a window where you can select a security level will pop up. Just choose the erasing level you want and click "OK" to confirm your option. 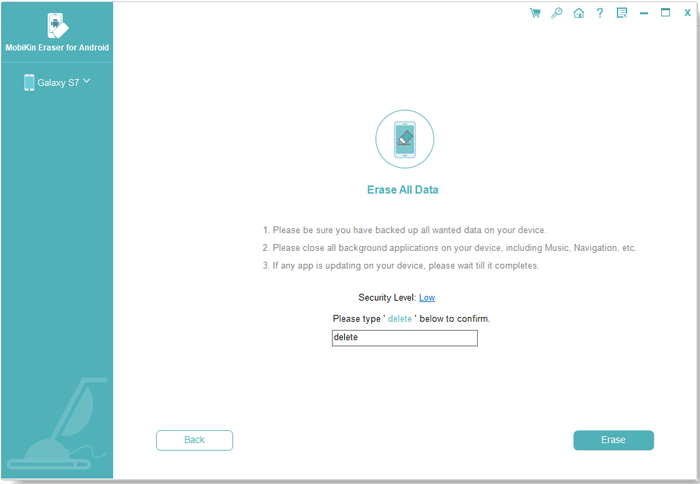 Note: For Android device, the software only allows the Erase All Data mode for now, so please make a backup before the process. And the software will be improved soon with more modes. Step 3. If you are sure to erase all data, just type the word of "delete" and then hit "Erase" button to remove them immediately. 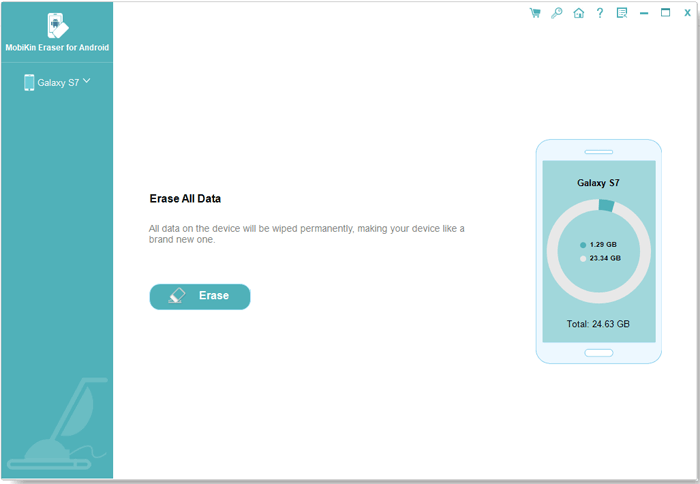 Android Data Eraser is a great data erasing program for Android users and it gains high successful rates in deleting not only corrupted files, but also other types of data on your Android phones and tablets. All your selected files can be erased peramently without any data recovery possibility. Therefore, have a try with the program to wipe out your Android phone.